Another redesign came in 1967 along with a familiar name: the upscale Ranger trim line in addition to the base and Custom Cab trim levels. In 1968, federal regulations required all automotive manufacturers to add side marker reflectors or lights, so Ford redesigned the hood emblems to incorporate reflectors. The same year the trucks received larger versions of Ford's FE engine family with the introduction of the 360 and 390 cubic inch engines. Also changed for 1968 were the heater controls, arm rests, interior door handles and window cranks, and the upper trim moulding on models so equipped. Rear side marker reflectors were also added to the lower bed side panels in 1968, per government regulations. The 302 V8 became an option in late '69. The top trim for 1970 was now named Ranger XLT with Ranger, Sport Custom and Custom rounding off the rest of the line. The fifth generation bodies were noted for durability and simplicity of design making them a favorite for restoration. After the 1968 models, Ford discontinued the "Low GVWR" versions. Still available was the Camper Special option, along with the new Explorer Special (a limited edition trim and option package), Contractor's Special(including a behind the seat toolbox and 3/4 ton (F-250) suspension), Farm and Ranch Special, and Heavy-Duty Special. Most of these "specials" from 1967 to 1972 were made in relatively low numbers and are now becoming increasingly difficult to locate.Voltmeters and oil pressure gauges were optional. The fifth-generation F-Series was introduced in Brazil in 1971, which remained in production until circa 1992 with a slight redesign and changes in its motorizations. It was the last Ford truck manufactured in the Ipiranga plant, that was soon closed. 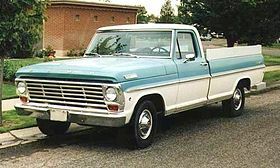 At the end of the 1972 F100 production a low number of trucks made had the 1973 body.